Jefferson County Road H-46 from Redwood Avenue to the southeast corporate limits (SCL) of Fairfield, Iowa, is a paved roadway approximately 6.5 miles long made of asphaltic concrete pavement with curvilinear alignment. 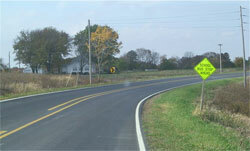 The roadway consists of a 22 ft wide pavement, last overlaid in 2002, with 3 to 4 ft wide earth shoulders. Traffic estimates indicated volumes ranging from 500 to 1,590 vehicles per day, with numbers increasing as the route nears Fairfield. This roadway was found to be among the highest 5 percent of similar Iowa roadways in terms of severity of run-off-road crashes. In response, Iowa Department of Transportation (Iowa DOT) requested a road safety audit to examine the roadway and suggest possible mitigation. Representatives from the Iowa DOT, Federal Highway Administration, Institute for Transportation, local law enforcement, and local government met to review crash data and discuss potential safety improvements to this segment H-46.